The Koutoubia Mosque, visible from many vantage points of Marrakech and towering over the world famous Jmaa el Fna Square, is an iconic symbol of the so-called ‘Red City.’ At 77 meters (over 252 ft), it dominates the skyline and is a useful orientation aid. 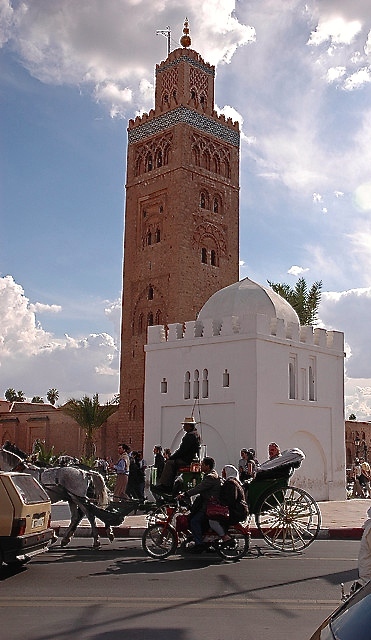 Look out for the minaret with its distinctive four cooper balls from the roof of your riad or hotel. On clear days you will spot it from the window of your plane as you arrive for your Marrakech vacation in the Moroccan sky. Built in the 12th century, the Koutoubia is one of Marrakech’s oldest buildings. It remains the city’s largest mosque and was completed under the reign of the Almohad Caliph Yaqub al-Mansur (1184 to 1199). A unique experience of any visit to Marrakech to sit on one of the cafe terraces in Jmaa el Fna as the sunsets behind the Koutoubia and the call to prayer rings out before the beautiful floodlighting is illuminated over the mosque. Although not open to non-Muslims, the Koutoubia and the 2 hectares (5 acres) Lalla Hasna gardens within which it sits are one of Marrakech’s most popular tourist attractions. In the Moroccan-Andalusian style, the gardens are laid out in a symmetrical pattern with fountains and fruit trees which frame the minaret perfectly for your holiday photographs. Also worth looking out for at the base of the Koutoubia Mosque is the tomb of Koubba de Lalla Zohra. Although typically Islam forbids the worship of any individuals, Moroccan Islam incorporates the worship of saints and holy men and women, known as marabout. When travelling, you will see the mausoleums and monuments to their memory across the country – typically as white-washed, square koubba buildings with domed roofs and crenulated walls. Beside the Koutoubia, you will find one such tomb, that of Koubba de Lalla Zohra (also known as Lalla Zahra el Kouch). She was buried here in the 18th century. As is common in Moroccan history, where little was recorded in writing and stories morph slightly with each recitation, Zohra’s origins are unclear. The most common legend has it that she was the daughter of a liberated sub-Saharan slave who, after converting to Islam, became an Imam (Islamic preacher). Another indicates her father was Abdellah el Kouch, chef to a Sheikh. A further story, perhaps tangled in the mists of time, suggests she was actually part of the Almohad dynasty and therefore a kind of aristocrat. Either way, locals believe that by day she was a woman who died young, but by night she became a dove. Flying through the ancient city, she performed miracles and religious acts and learned all of Marrakech’s secrets. In a religion dominated by male scholars, Lalla Zohra is an important figure for local women and has assumed the status of a saint. Many pay their respects at her tomb and send their children to be blessed there. Some Marrakchis may still name their children after Zohra. Rumour has it that some women avoid eating dove or pigeon (a key ingredient in Moroccan pastilla pastry) in her honour. You cannot enter the Koutoubia Mosque, but the area around it is certainly worth a visit and a while on a bench under the shade of a citrus tree (perhaps contemplating the legend of Lalla Zohra) makes a welcome break from the bustle of Place Jmaa el Fna and the medina.